Representatives from the three most ambitious research projects of the European Union, the FET Flagships – Graphene Flagship, Human Brain Project and Quantum Flagship – reunite at the ICT 2018 Conference (Vienna, 4-6 December). The Graphene Flagship, the Human Brain Project, and the recently launched Quantum Flagship, will showcase their projects at the ICT 2018: Imagine Digital – Connect Europe exhibition to take place in Vienna, 4-6 December 2018. The three ground-breaking projects will bring interactive demos and prototypes highlighting recent advances in the fields of graphene and related materials, neuroscience, medicine and computing, and quantum technologies. With a life-span of 10 years and a budget of EUR 1 billion each, FET Flagships are the most ambitious research projects funded by the European Commission. The fleet of all three FET Flagships – Graphene Flagship, Human Brain Project, and the recently launched Quantum Flagship – assemble at the ICT 2018 Conference in Vienna (4-6 December 2018) to showcase their projects. Located in three neighbouring booths in the conference exhibition, visitors will be able to experiment with quantum devices, interact with the latest atlas of the human brain and touch the first industrial prototypes of graphene-enabled flexible electronic devices. Experts from each of the FET Flagships will travel to Vienna to share their knowledge and discuss the most recent highlights within their respective fields. 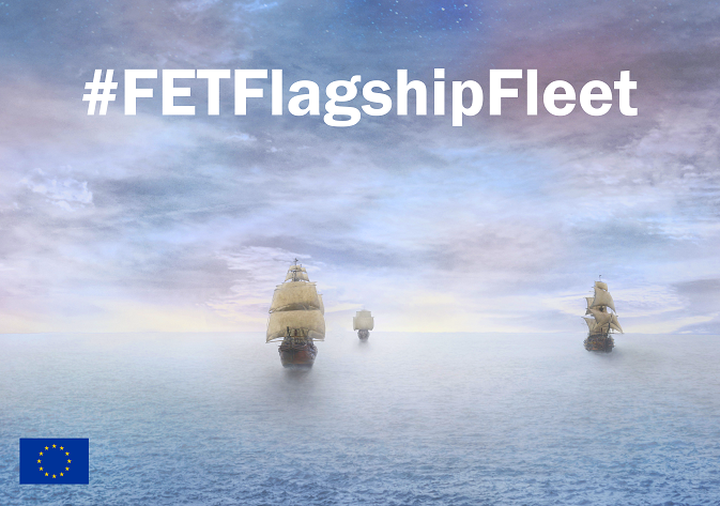 With a life-span of 10 years and a budget of EUR 1 billion each, FET Flagships are the most ambitious research projects funded by the European Commission. These collaborative endeavours gather scientists from academic institutions, research centres, SMEs and industry to consolidate the leadership of the EU in disruptive and innovative fields, like graphene and related 2D materials, computational neuroscience and next generation artificial intelligence, and quantum technologies. The Graphene Flagship, launched in 2013 and just starting the second-half of its life, aims to take graphene from the realm of academic laboratories to the market, enhancing products from faster and more reliable optic and electronic devices, to longer lasting batteries for our phones and cars and even more environmentally friendly construction materials. Many researchers within the Graphene Flagship project head down a path to greater sustainability – graphene solar cells will populate a new solar farm on Crete, and Graphene Flagship partners are using graphene to create lighter airplanes that will dramatically reduce greenhouse gas emissions. The Graphene Flagship is also working towards the standardisation of the production and quality control methodologies of graphene and related materials, to meet the demanding requirements of manufacturers worldwide. The Human Brain Project (HBP), which also launched in 2013 and just passed the halfway point of its funding horizon, strives to accelerate the quest for a greater understanding of the human brain, its diseases and brain-inspired innovations in computing. To this end, neuroscientists, medical specialists, computer and robotics experts work together in the project to build and use a unique ICT-based infrastructure for brain research. The approach of integrating brain science and technology has delivered many significant advances. In medicine, HBP research contributed towards the invention of a technology that enables paralysed patients to walk again, using a prosthetic that stimulates nerves in the spine. HBP researchers also developed a new methodology to improve the success rate of epilepsy treatment which is about to begin a large-scale clinical trial. HBP also investigates technological applications – two of the four most advanced brain-inspired neuromorphic computing systems in the world, SpiNNaker and BrainScales, are being developed within the project. HBP teams also work to transfer principles of biological learning to new bio-inspired artificial intelligence. These emerging technologies pave the way to overcome current limitations of traditional computing and AI. The third and newest member of the Flagship Fleet, the Quantum Flagship, has just been launched in October 2018, comprising 20 projects within its ramp-up phase. It will address core applications of quantum technologies such as communications, sensing, metrology, computing and simulation, all of them supported by basic science investigations. These applications address ultrafast and precise sensing for medical applications, encrypted communications secured by the laws of nature, solutions to the hardest problems in computing, and tools to better model the properties of materials and molecules. The Quantum Flagship will aim to bring these results from basic research labs to society by means of commercial applications. All these advances will help to create the next generation of disruptive technologies, searching to place Europe as a worldwide knowledge-based industrial and technological leader in this innovative field.